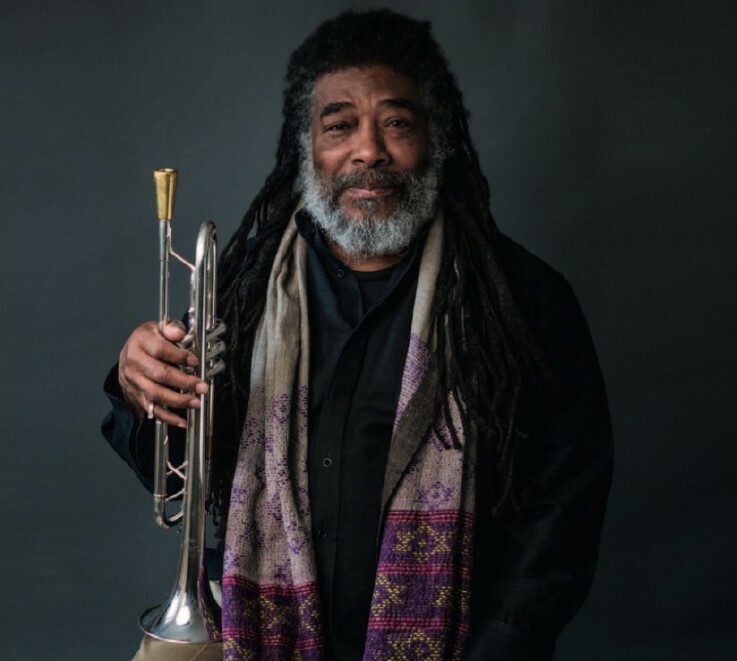 Wadada Leo Smith’s new album Najwa features four compositions in tribute to past masters of creative music, Ornette Coleman, John Coltrane, Ronald Shannon Jackson and Billie Holiday, as well as the title composition ”Najwa” in remembrance of a love lost. 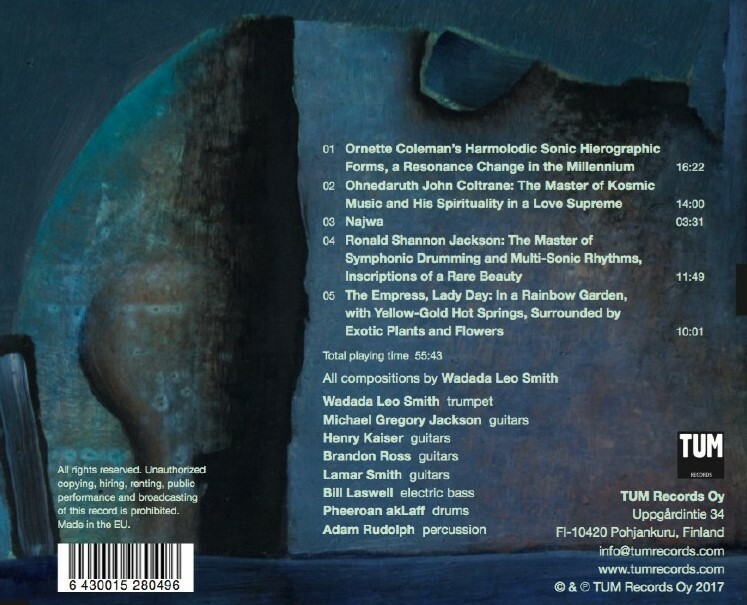 Compared to Smith’s prior recordings, the presence of four guitarists and Bill Laswell’s electric bass create a unique sound world and fluidity for the music. The first two extended compositions that open the album are dedications to two great masters of creative music, Ornette Coleman and John Coltrane, and each takes the form of a mini-suite. “Each has a second movement within the context of the overall shape,” says Smith. “They’re shaped like miniature suites within the context of a single album. And then the whole album has the shape of a tribute. It’s all about people and, therefore, it’s also organically unified, based around these people who I respect.” Next is the brief but touching “Najwa,” followed by a dedication to the sometime drummer of Smith’s Golden Quartet, Ronald Shannon Jackson. The CD closes with the achingly beautiful “The Empress, Lady Day,” one of Smith’s several compositions dedicated to Billie Holiday. “I’ve written more compositions for Billie Holiday than maybe any other person,” Smith says. “She was a great performer/composer.” Although Wadada Leo Smith has worked with electric guitars in the past, including in his Organic ensemble and in Yo Miles! which he co-led with Henry Kaiser, Najwa puts the guitar in an even more central role. All four guitarists have worked with Smith before; Michael Gregory Jackson since Smith’s early years in New Haven in the 1970s, Henry Kaiser in Yo Miles!, and Brandon Ross and Lamar Smith (Smith’s grandson) in Organic. In addition to the guitars, Bill Laswell’s electric bass takes a central role in the sonic world of Najwa and Laswell also played an important part in the post-production and mixing of the music on the album. Smith says that he enjoyed “the idea of making this session and then going back and re-recording some of the areas and then sitting down with Bill and allowing him to tweak it in certain ways and re-reference it in a whole different way. I very much like that notion, that idea or that philosophy.” This was the first time Smith and Laswell recorded together but their collaborations have continued both live and in the recording studio. 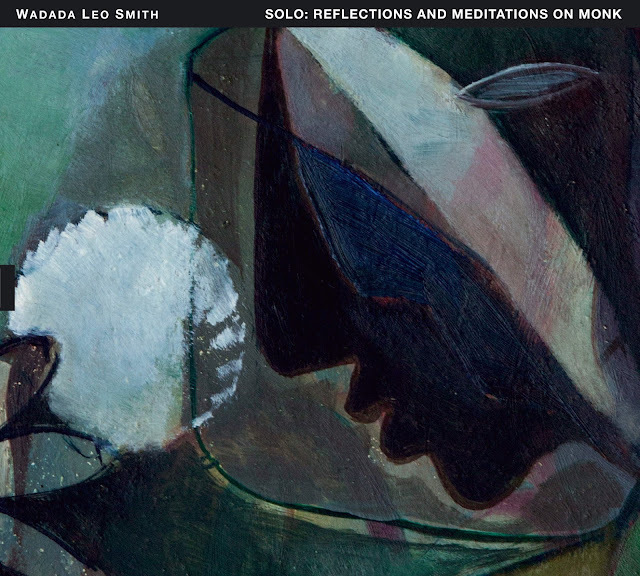 Wadada Leo Smith’s new album Solo: Reflections And Meditations On Monk features his solo trumpet on four classic Thelonious Monk compositions and four new compositions by Smith inspired by Monk, the artist that Smith feels closest to in the historic continuum of creative music. “Most people would never realize that I am closer to Thelonious Monk than to any other artist,” says Smith. “What connects us is a vision of composition and its forms, music psychology, and our articulation of the ensemble as a trashing field for new information.” From the time he listened to the early masters of modern jazz as a teenager, Smith felt that “ It was Monk, his ideas of a band and composition, that were the closest to what I dreamed of being as an artist. His history of composition and his knowledge of how to use sound were a prime motivator, really, for me wanting to be a composer. I would go back and forth between him and Duke Ellington on this, but Monk had the upper hand in the end.” Smith’s fascination with Monk’s solo recordings began more than five decades ago, when he purchased the recording Thelonious Monk Alone In San Francisco. “The essence of Monk is, I believe, in his solo performances” says Smith. “All those pieces, the solo music, follow the primary formula of the compositions, but they all stray, they all lead to expansions and further explorations allowing the compositions to grow and become renewed each time he plays them. The way in which I play Monk’s melodies on this recording, they are all personal: they are not based on chord progressions, they evolve essentially by proportion – long notes, short notes. Each of them is played, they move, in a way in which I can celebrate his melody, but seen through my expression of it.” In addition to four classic Monk compositions, “Ruby, My Dear,” “Reflections,” “Crepuscule With Nellie” and “'Round Midnight,” the album includes four new compositions by Smith inspired by Monk and his personal history whether real, imagined or dreamed. Together, the pieces form a unique collection wherein the two composers seem to communicate with each other through Smith’s solo performances. Smith’s first recording as a leader was also a solo album (Creative Music–1 in 1971). Since that time, he has continued to perform solo concerts and record additional solo albums (Solo Music/Ahkreanvention in 1979, Kulture Jazz in 1992 and Red Sulphur Sky in 2001). Solo: Reflections And Meditations On Monk is, however, Smith’s first solo recording that includes another composer’s music. Smith has also begun performing Monk’s compositions live for the first time. 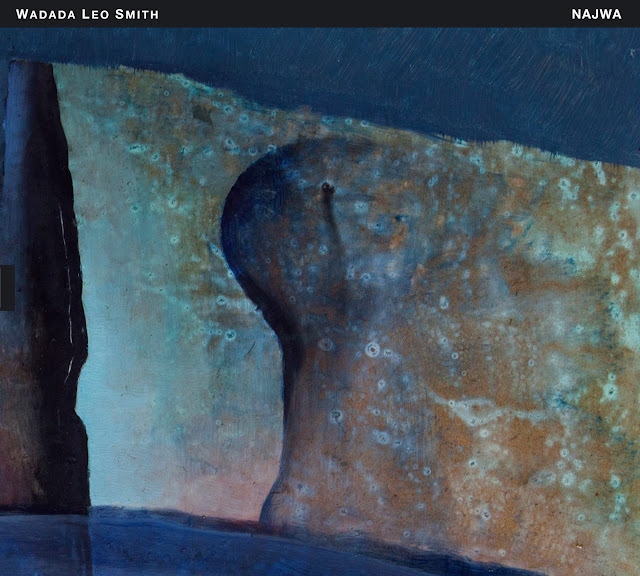 Wadada Leo Smith (b. 1941), who was part of the first generation of musicians to come out of Chicago’s Association for the Advancement of Creative Musicians (AACM), has established himself as one of the leading composers and performers of creative contemporary music. 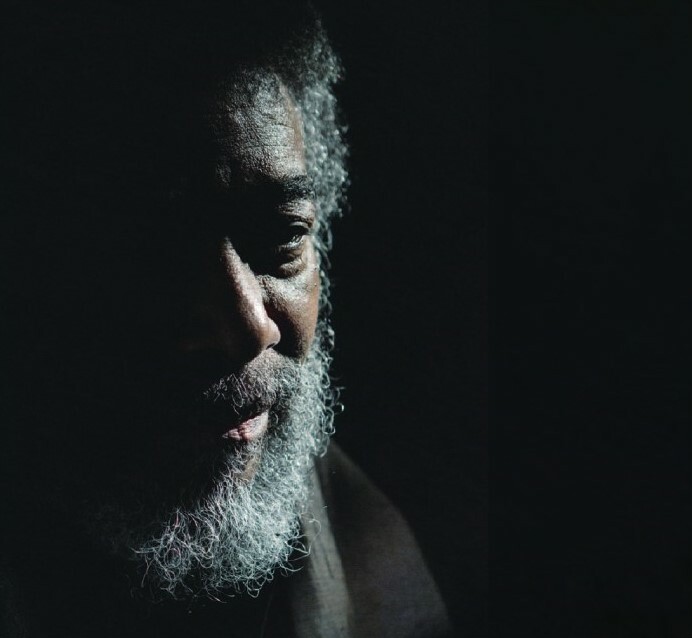 In the late 1960s, Smith formed the Creative Construction Company together with saxophonist Anthony Braxton and violinist Leroy Jenkins and, since the early 1970s, he has mostly led his own groups, which currently include the Golden Quartet, the Great Lakes Quartet, Mbira, Organic and the Silver Orchestra, among others. In 2012, Smith released his most extensive recording to date, Ten Freedom Summers, a fourCD collection which was one of three finalists for Pulitzer Prize in Music in 2013. 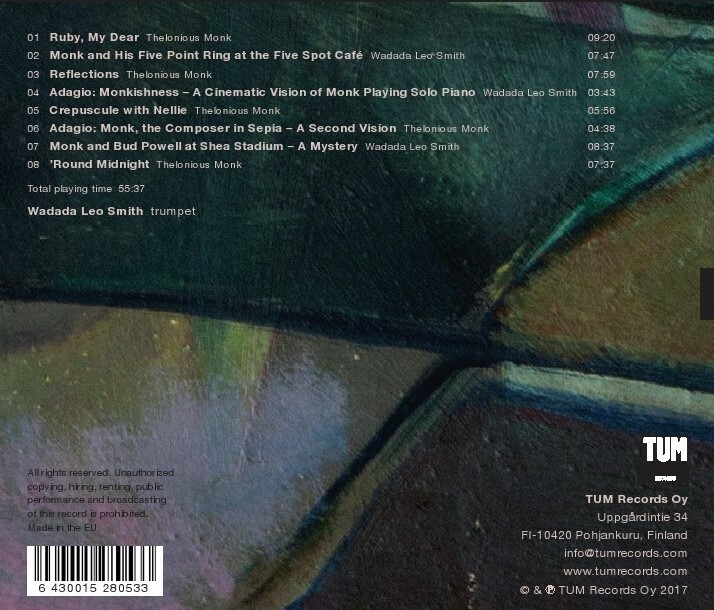 In 2013, he released Occupy The World (TUM CD 037-2), a two-CD recording of six extended compositions performed by Smith with TUMO, a 22member improvising orchestra. 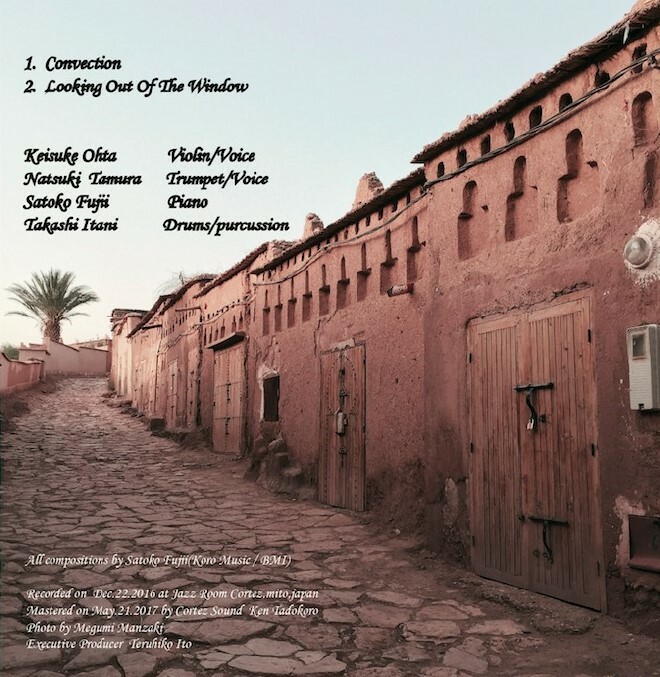 The Great Lakes Suites (TUM CD 041-2, a double-CD with Henry Threadgill, John Lindberg and Jack DeJohnette) was broadly hailed as one of the top albums of the year in 2014 as was the duo recording with bassist John Lindberg, Celestial Weather (TUM CD 046), in 2015. In 2017, Smith received awards for Jazz Artist of the Year, Jazz Album of the Year (for America’s National Parks) and Trumpeter of the Year in DownBeat’s 65th Annual Critics Poll and was named Musician of the Year by the Jazz Journalists Association. On April 20, 1965, one of the most adventurous and far-reaching recordings in jazz - or music - history was made in New York City. The great Sun Ra and his Solar Arkestra convened in engineer Richard L. Alderson's RLA Studio and crafted The Heliocentric Worlds of Sun Ra, an amazing and enigmatic recording that continues to astonish listeners to this day. Somewhere between outer space chamber music and avant-garde jazz, it introduced listeners to sounds not normally heard in improvised music. The album's boundary-stretching jazz sounded like no other record made by anyone, ever. 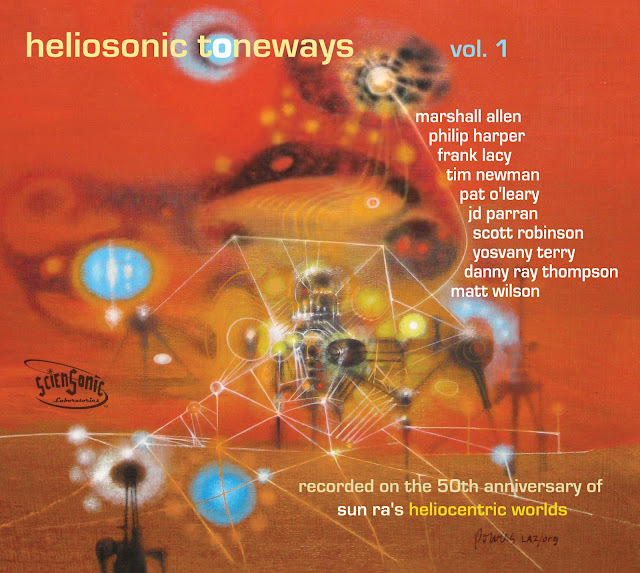 Now, fifty years later, ScienSonic Laboratories has created Heliosonic Toneways, Vol. 1, an historic new recording in the intrepid spirit of the original Heliocentric Worlds. On April 20, 2015, original participant Marshall Allen (now 93 and still highly active as leader of the Arkestra) and longtime Arkestra member Danny Thompson joined an incredible cast of some of New York's most creative musicians at the behest of ScienSonic's founder, multi-instrumentalist Scott Robinson. Along with trombonist Frank Lacy, trumpeter Philip Harper, bassist Pat O'Leary, saxophonist Yosvany Terry, bass trombonist Tim Newman, drummer Matt Wilson and bass clarinetist JD Parran, Robinson and the Arkestra vets reentered the orbit of that landmark recording created a half-century earlier. 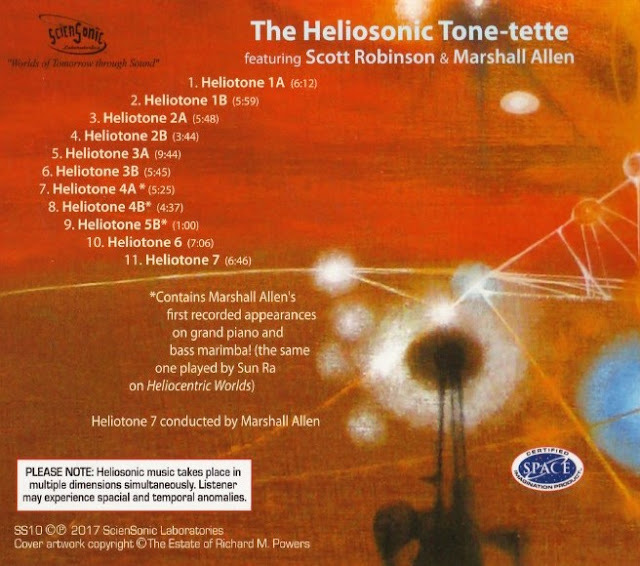 Heliosonic Toneways is not a recreation or remake of Heliocentric Worlds; instead of duplicating the original music, Robinson's goal was to use the extraordinary sonic template of the original recordings - the same instrumentation and distinctive sounds - to create new and imaginative music that would honor the spirit of the original sessions while also setting off into new and completely uncharted terrain. This is ScienSonic's most ambitious project yet, and the results are remarkable. One of the unique facets of Heliocentric Worlds was the album's use of an expanded palette unprecedented in even the most experimental jazz, incorporating such unusual instruments as timpani, piccolo, and the haunting bass marimba. Some months later, Volume Two followed with the addition of chromatic sets of "tuned bongos" and the eerie, electronic Clavioline. The distinctive aural environment of these two recordings, along with an offbeat musical methodology which blurs the lines between composition and improvisation, makes for utterly singular music which truly lives up to the admonition on the back of the original LP jackets: "YOU NEVER HEARD SUCH SOUNDS IN YOUR LIFE." Robinson's ScienSonic Laboratories was the most fitting locale in which to record these extraordinary sessions; his converted garage houses one of the world's most extensive collections of obscure musical instruments, the fruits of years spent combing flea markets and junk shops. Among the lab's treasures is the original bass marimba that Sun Ra played on Heliocentric Worlds, heard here in the hands of Scott Robinson and Marshall Allen himself. Also returning from the 1965 recording is original engineer Richard Alderson - who had not worked with Allen since the Heliocentric sessions but was tracked down and recruited to engineer the date. This made for a truly historic three-way reunion - fifty years later to the day! - between Allen, Alderson, and the original instrument that figured so prominently on the 1965 LP. A strange twist was added when news arrived during the sessions of the passing of Bernard Stollman - whose ESP label had issued the original Heliocentric LPs - on the very same day. The results include Marshall Allen's first-ever recordings on piano and bass marimba, in addition to his customary alto sax and EVI. It was captured in a marathon session, resulting in enough material for two releases - look out for Volume Two in 2018. Despite many setbacks including pouring rain, technical difficulties, and long delays in the mixing process, the results of this massive effort can finally be heard. This is startling and unforgettable music, captured with extraordinary clarity and sonic detail - music that could only have taken place at ScienSonic Laboratories, with these musicians, these sounds. This is music that takes you somewhere... somewhere utterly unfamiliar, yet strangely inviting. Or, as Sun Ra used to say, "Somewhere there." From an audiophile standpoint, Alderson calls it "the best recording I have ever made." And while it is unlike any other Laboratory production to date, this music certainly lives up to the ScienSonic motto, "Worlds of Tomorrow Through Sound." 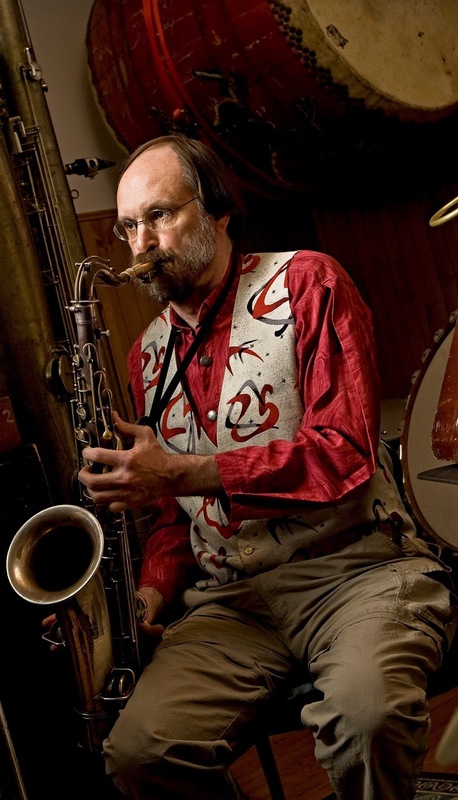 Please visit www.sciensonic.net to learn more about our previous releases with Julian Thayer, Marshall Allen, Roscoe Mitchell, Henry Grimes and more. Become a Laboratory Member! 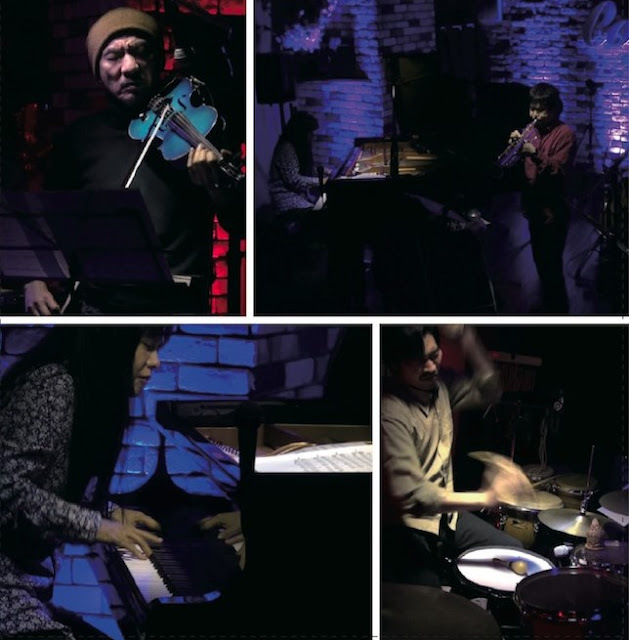 Pioneering Japanese free jazz violinist Keisuke Ohta joins pianist Fujii for a delightfully unpredictable live recording of previously recorded tunes. 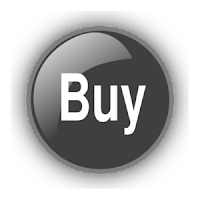 Sometimes you just have to trust your instincts. 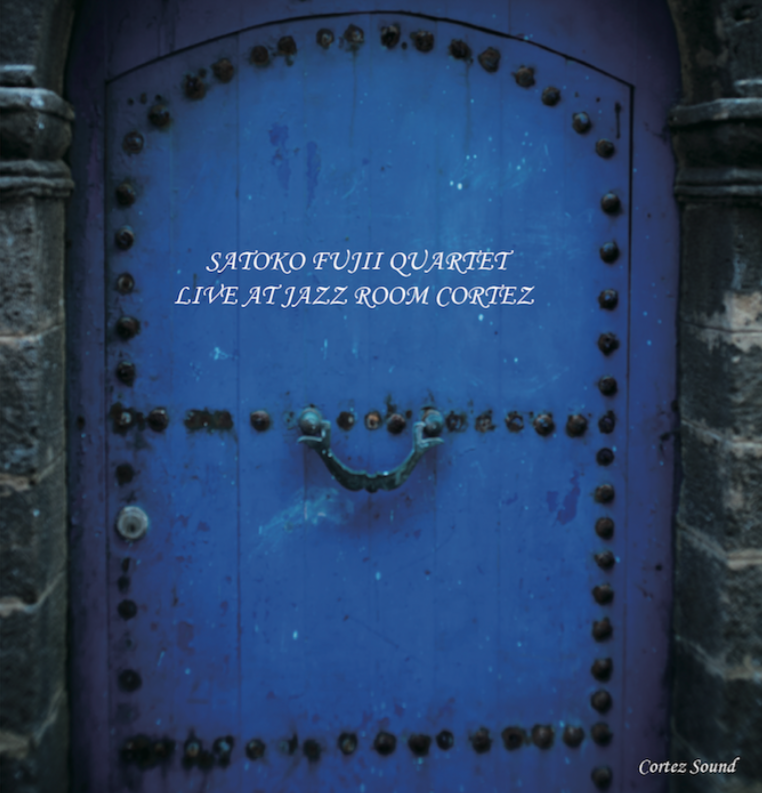 And that’s what pianist Satoko Fujii did when she assembled the quartet heard on her latest album, Live at Jazz Room Cortez available October 20, 2017 via Cortez Sound. She could have put together a traditional band with rhythm section and a horn player. 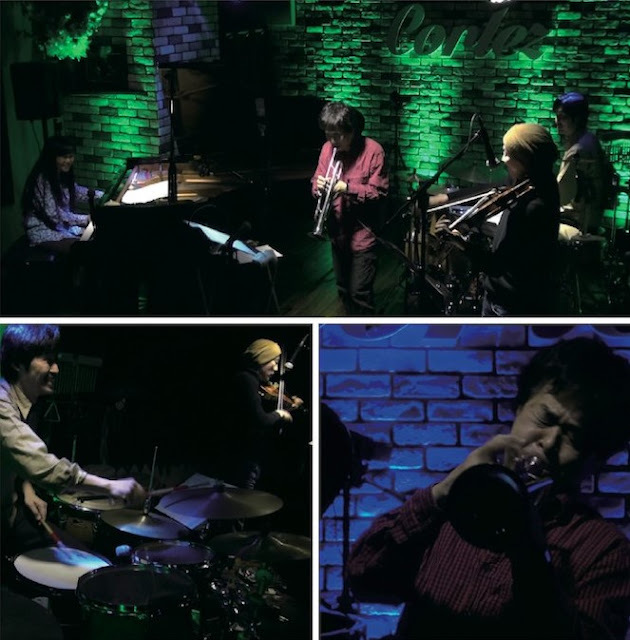 She knew she wanted to use longtime compatriots trumpeter Nasuki Tamura and drummer Takashi Itani. But something told her to use violinist Keisuke Ohta instead of a bassist and she went with her gut feeling. The result is an album with a unique group sound and vision that brings fresh insight into her compositions. Indeed, everyone shines, both individually and as members of the ensemble, throughout the disc. “Convection,” first heard on Fujii’s New Trio album, Spring Storm (Libra, 2013), receives an extended treatment full of contrasting events and surprising changes in direction. 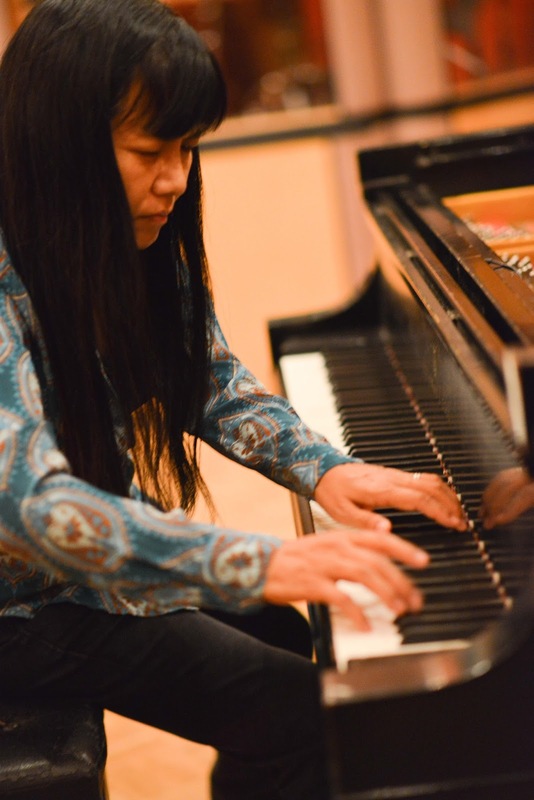 A series of improvised sections which Fujii signals the end of with a gorgeous, ringing chord, “Convection” mixes absurdity and surrealism with lyricism and pure sound in a virtuoso ensemble performance. Fujii reaches all the way back to her first trio with bassist Mark Dresser and drummer Jim Black for “Looking Out the Window,” the title track of their 1997 debut recording. The track opens with a playful mix of voices, folk influences, and unusual timbres and textures before segueing into a sequence of unaccompanied solos by each member of the band. The piece culminates with a rapturous reading of the tune’s melody. Fuji has a well-deserved reputation for assembling unconventional bands of kindred spirits to bring her musical vision to life. The product of a moment’s inspiration, the quartet on Live at Jazz Room Cortez realizes her vision with sensitivity, imagination, and total commitment.